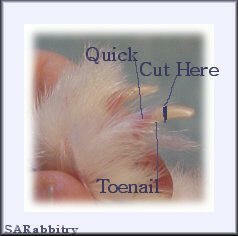 It is important to clip your rabbit's nails at least every 2 months. The more you clip their nails, the shorter their nails will be. It is a very simple thing to do all by yourself. 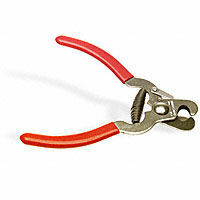 You can use animal nail clippers, or if you don't want to buy a pair, you can use people nail clippers as well. Turn the rabbit over in your lap with his head facing away from you. Put his ears between your knees, and squeeze them, so his ears/head is pinned there. (this way he will sit pretty still for you. Clip their nails just above the quick (refer to the pic). If you happed to quick his nail and make him bleed, you can put some quick stop powder on it, or just put them back in their cage, they will lick it and it will stop bleeding. It is no big deal.